Lijiang is a beautiful old town in China, which is over 3000km away from Beijing. This page is about how to travel from Beijing to Lijiang. 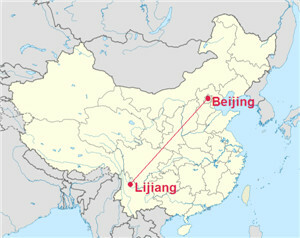 Step 1: Book a flight ticket or train ticket from Beijing to Lijiang. There are no direct trains from Beijing to Lijiang. However, trains from Beijing to Kunming and Kunming to Lijiang are available. You can take a train to Kunming first and then transfer to Lijiang. Take Subway Line 9 and get off at Beijing Railway Station. There are six trains travelling from Beijing to Kunming everyday. Public bus: No.4, 18 Bus. If you would like to take a taxi to Lijiang Old Town, it’s best to make a deal before you get on the car. Step 2: Book a hotel in Lijiang. Step 3: Take a tour in Lijiang.